This is an excellent hotel. Rooms are very nice and clean. The best part is that it is connected to Circle Center Mall. It is in walking distance to great restaurants and sports facilities. The exercise room needs to have extended hours especially for guests that are from a different time zone. Connected to the mall and walking distance to restaurants. The exercise facility closed at 10pm, way too early. The hotel staff was extremely helpful especially the valet. Our room was very large. The room needed more lighting and the bathroom mirror needs to be lower for those us who are only 5 star. Bathroom arrangement towels too far from shower and lighting in room was poor. Their customer service is superior to other comparable hotels. I appreciate the fact that they use washable comforter covers keep the clean. Omni is my first choice hotel in Indy downtown. Omni is my first choice in hotel in Indy. Toilet was not quite clean. Located in the heart of Indianapolis, the award winning, four diamond Omni Severin Hotel is connected to Nordstrom, Circle Centre Mall and the Convention Center. This elegant, luxury hotel proudly serves as the city's most convenient and luxurious address for business and pleasure. From the moment guests enter the lobby, they will be treated to world class service by the hospitable staff. When they are not exploring the upscale shopping and dinind in the area, guests can relax in their luxury guest room accommodations or enjoy a fine meal at not, but four on site restaurants and bars specializing in evreything from fabulous coffee to the perfect martini to upscale gourmet dining. Located just nine miles from the Indianapolis Airport, the Omni Severin Hotel is central not just to the shopping district, but to all that the Indianapolis area has to offer. A variety of rooms are available at the Omni Severin Hotel, from deluxe guest rooms to two level stuites to fabulous penthouse apartments with awe inspiring views. All rooms include amenities such as high speed wireless internet access, speaker phones, plush robes, fully stocked refreshment center, coffee maker, hair dryer, and iron with ironing board. Built in 1913, the elegant Omni Severin Hotel offers the most contemporary amenities while maintaining its historic charm. A complimentary airport shuttle leaves from the hotel to the airport Monday through Friday at 6 a.m. Guests will have no trouble staying fit with a 24 hour fitness center and indoor heated year round pool. A range of services, including valet dry cleaning, twice daily housekeeping service, evening turndown, and shoeshine service make sure that guests are always cared for. When they are not exploring the area, guests can check out the in room LodgeNet system featuring on-demand hit movies and Nintendo 64 video games. The Omni Severin offers a world class hotel experience guaranteed to impress even the most worldly traveler. Every detail of your stay here has been thoughtfully considered and provided for in the most deluxe manner possible. Guests report that the staff is eager to hep in any way, as guests would expect from a hotel of this class and price range. 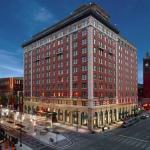 With sumptuously furnished rooms in a stunningly decorated building, this hotel offers an experience unlike any other in the Indianapolis area. Parking: Yes, there is parking. Both self parking and valet; charges apply. Pets: Yes, pets are allowed. Small pets only; charges apply.